Currently, pilots conduct a major part of their flight training in ground-based simulators. The level of realism, or fidelity, of the simulator is a key factor in the quality and effectiveness of such simulator-based training. An important part of the fidelity of a simulation is the feel of the control systems. In aviation and driving alike, pilots and drivers can for vehicles observe information about the vehicle state through the touch of the control inceptor. In aircraft, the stiffness of the yoke and pedals change with flight speed, and in most cases either artificially or through the feel of the forces on the control surfaces detect buffeting and stall phenomena. Likewise, in cars the stiffness of and forces on the steering wheel change with driving speed and road condition. In a simulator, accurate steering feel has to be recreated by control loading device. Electric or hydraulic actuators generate the control feel that is calculated by a control loading model implemented in a digital simulation. 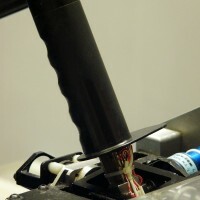 The Control and Simulation division at the TU Delft uses several control loading devices for its flight and driving simulation, and a large proportion of these devices have been developed in-house. Due to limitations in both the simulation model and the servo system, the level of fidelity provided by CLS is limited, and this can significantly affect the quality of flight simulators. The perceptual differences can cause an improper internal model and affect the learned behavior, reducing the value of flight simulators. The European Aviation Safety Agency (EASA) has specified the requirements on CLS in the time domain. However, these criteria are not supported by a comprehensive theoretical background. If these criteria are too strict, or not enough for desired extent of fidelity is still unclear. Therefore, the objective of this research project is to provide more straightforward and theoretically based requirements. The approach in this project is based on converting the limits in human’s perception of device dynamics, expressed in Just Notable Difference (JND) levels, into criteria for device fidelity. Since not enough data is available on JND for device dynamics, several experiments have been performed. Using the results, a unifying model, which predicts dynamics JND from the basic human perceptual processes, is proposed. Current work is on extending the model, and developing and testing the new criteria.